Frank Calabro Jr's 3 Step Formula Review - Legit or Scam?!? Frank Calabro Jr’s 3 Step Formula Review – Legit or Scam?!? Frank Calabro Jr’s 3 Step Formula Review – What is Frank Calabro Jr’s 3 Step Formula and how does it work? Can you make money with Frank Calabro Jr’s 3 Step Formula? Legit or Scam? Read this review now! Overview: Frank Calabro Jr’s 3 Step Formula is actually 3 different products. 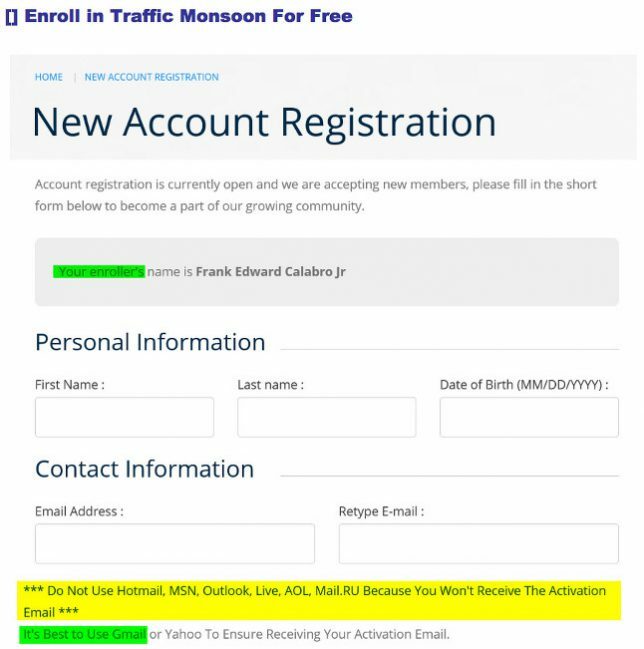 Traffic Monsoon, a Traffic Exchange with revenue share. 4 Corner Alliance, a Financial e-book MLM. And finally, Power Lead System, a Marketing System MLM. Needless to say, Frank Calabro Jr is an affiliate of all these 3 products. When you go through his training one step and a time, he’ll guide you how to sign up with his referral links. Frank Calabro Jr’s 3 Step Formula Review – What is it all about? First thing comes to my mind when I research on Frank Calabro Jr’s 3 Step Formula is, “Hey, this looks like The Email Syndicate!”. Both are skeleton system where the owners guide you one step at a time to purchase 3rd party product to plug into their system. In this case, Frank Calabro Jr’s 3 Step Formula. 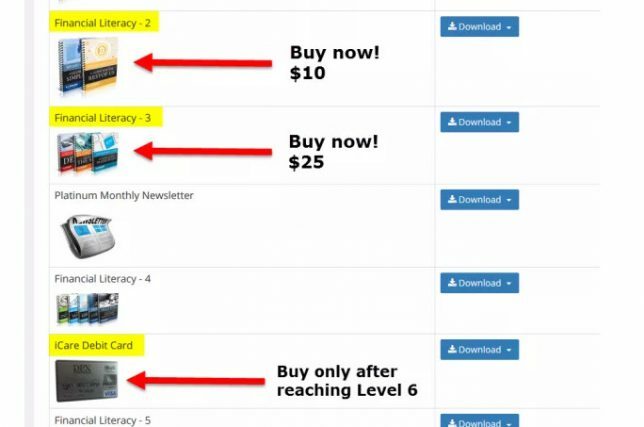 The only difference is that Frank did not teach you how to connect the 3 products you are signing up under him, rather you are signing up each individual product to make money. One thing for sure, he is a seasoned and slick MLM Marketer. Through his video presentations, I believe many people looking for making some money online will certainly sign up under him. Will you be as successful as him and make $1000’s/mth? He will go through with you what is Traffic Monsoon and how you can make money from it. Step by step. Frankly speaking, the video was indeed very convincing. He presented in a way that it seems that anyone can make money by just clicking the mouse! It is true that you are able to make money from Traffic Monsoon, but hey did he just mentioned to you that you have to purchase AdPacks for $50 a pop! In simplicity, Traffic Monsoon is an ad revenue sharing Traffic Exchange. This means that they will share whatever revenue they have from Adpacks sales, minus their profit, to everyone holding AdPacks. The more AdPacks you are holding, the more shares you will receive from the revenue pie. This will go on and on until your AdPacks received a $55 dollar value in return and then they expire. Each AdPack, when expired, you earn a merely $5. The disclaimer Traffic Monsoon gives is that they never guarantee you how long each AdPack will take to expire. These details were missing from Frank’s presentation. Just imagine, to earn $100, you need to purchase 20 AdPacks, which will cost you $1000 cold hard cash up front. And you have to click and view 10 Ads per day to qualify for the revenue share, and hoping the Ad Packs will expire soonest! Step 2 is just step by step Sign up instructions for the dummies. 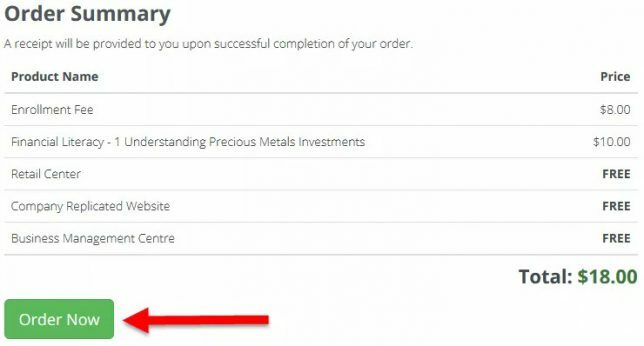 It is easy to follow and it is a clever way for Frank to ensure that you’ll sign up with his affiliate links. In this video, Frank Calabro will tell you about multiple income streams and how he has spent 12 months to research and connecting the dots. Then he’ll log into his 4 Corner Alliance Group account to show you how many referrals he has and how much he has made over a few months. 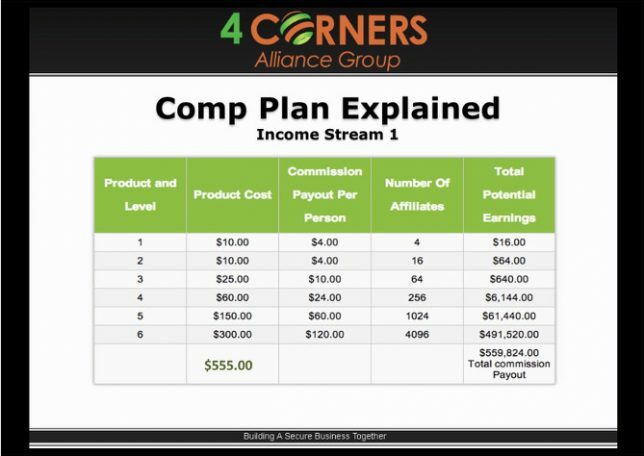 Following that, he will share with you the products of 4 Corner Alliance Group and their compensation plan. He emphasizes a lot on the low entry point of $18 of 4 Corner Alliance Group and how does the system automatically upgrade you to your next level if you hit the current level’s income. He also shares with you the 7 income stream of 4 Corner Alliance Group. For the most part of the video, he talks about the compensation plan and the 7 income streams. Yup, a little to nothing was mentioned on the benefit of the Financial e-book products. You see, that’s how most Pyramid Scheme works behind the context of MLM selling e-books of little or of no benefits. Your main purpose at 4 Core Alliance is to recruit your downlines to sell the same e-books to their downlines and so on. When many people see through the scheme and no one wants to purchase the products anymore, the pyramid crash and the lower tier people suffer the most losses. Low entry point? Let’s find out more. Step 2 is again step by step Sign up instructions for the dummies. First product, Financial Literacy, $10. Enrollment Fee $8. Yup, $18, checked. Next, Frank Calabro Jr tells you to subscribe to Monthy Newsletter and the Starien Subscription. Hey, did he mentioned earlier that Monthly Newsletter cost $29.95/mth and Starien Subscription cost $47/mth?! Following this, he tells you to buy Financial Literacy 2 and Financial Literacy 3 now! Total cost for both products, $35! $18+$35 = $53 One time cash out? $29.95+$47 = $76.95 monthly cash out?! Yup, you signed up with Frank’s affiliate link if you follow his step by step instructions. I have written a review of Lead Lighting which is the trip wire to Power Lead System. Frank talks about how you can use Power Lead System. 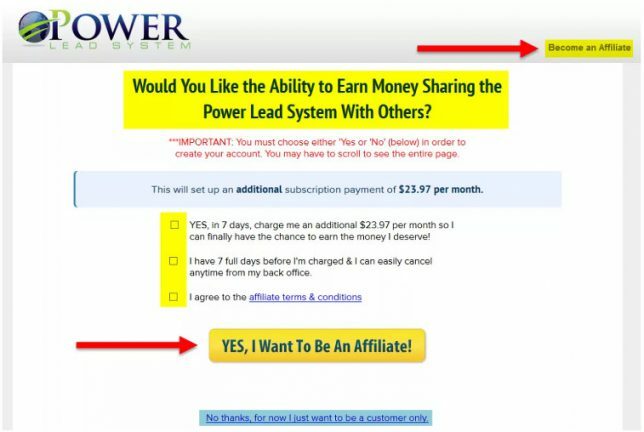 He kept mentioning its optional but “highly suggest” you become an affiliate of Power Lead System so that you can earn while you pass the system to others. Again this is an MLM with its marketing system as their product. I shall not elaborate more here as you can read my review of Lead Lightning. Step 2, you guessed it, step by step Sign up instructions for the dummies. You must purchase the Diamond Package to earn a $100.00 commission for all of your ‘odd’ numbered ‘Diamond’ sales. Once you’ve rolled up 5 Diamond sales, every fifth sale thereafter rolls up. (sales 2, 4, 6, 8, 10, 15, 20, 25, etc. roll up). You’ll also earn a 25% matching bonus on the entire pay line commission totals of ALL personally referred Diamond level sales. You must purchase the Platinum package to earn a $400.00 commission on ALL personally referred Platinum level sales. (There is no Platinum roll up sales). In addition, you will receive a $50.00 retail override on all Platinum sales made by your personally referred Platinum members. How much will Frank earn from you when you signed up all? You do the math. Personally, I feel that Frank is a slick MLM Marketer and a top salesman. He ran his traditional business for 15 years and I am sure he know a hell lot about sales. On the other hand, if you are new to online Internet Marketing business, your result might be drastically different from his. Of course, you can build your own referrals to do the same. But are you as capable and determined as him? Will you give up if you do not see any income for months?! Being an experienced MLM marketer before, I also know that MLM is not a simple business model as many have thought. There is no get rich quick without effort and hard work. Frank personally acknowledges that in his videos. How to market these 3 products? Who is your potential buyers? How to recruit your downline member? Are you going to “SPAM” your social account? How to create a website that generates viewerships? How to motivate your members to stay active so that you can have the monthly recurring commission? Have the MLM products benefited you so much that you are so convinced telling others about it, or are they just a mask for your recruitment? Is your sponsor there to guide and help you? I know, because I have been there and done that. I had spent $1000s on MLM products and even experienced recruiting before. I did countless presentations. Let me tell you, it is not easy to face rejections from your loved ones and close friends. Moreover, people will give up easily when they expect to see a fast income but when it did not happen. Also, there is a very thin line between MLM and Pyramid Scheme. There are many MLM companies Online selling E-products of no values as a mask for its Pyramid Scheme. Therefore, you have to be very careful not to fall into traps of these companies. To make Online Passive Income, I would definitely prefer Affiliate Marketing model. I rated Frank Calabro Jr’s 3 Step Formula 1.0 stars because I think he did not elaborate how each system he recommends works in details. 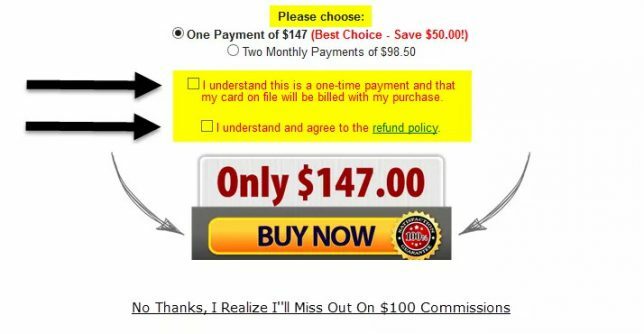 He merely focuses on telling how you could make money from the 3 system and show you step by step instruction how to sign up with his affiliate links. But he also tells you multiple time that “Results are not typical.” in his videos. I wouldn’t be surprised if, in future, he finds new shiny products that can give him a lot of affiliate commissions, he would recommend to all people who sign up for his email. 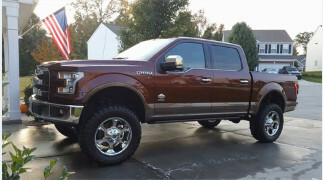 The cost outlay for Frank Calabro Jr’s 3 Step Formula is very high and you could be waiting for months before you could see your first profit income. Online MLM business model is definitely not quick and easy money, as you are required to recruit 1000s of active referrals. Ultimately, you have to ask yourself, are you prepare to take this risk and put in the massive effort required? ← Opinion Outpost Review – Opinion World? Legit or Scam?!? I was wondering what is Frank Calabro Jr’s 3 steps formula and thinking that the formula is just one product. After reading your review, I realized the formula has 3 products! For sure, I would not want to commit so much money to these products before I even earn some! Has Frank considered people who are looking to learn how to make money online actually do not have a lot to start with! Thanks for your review, Edmund! 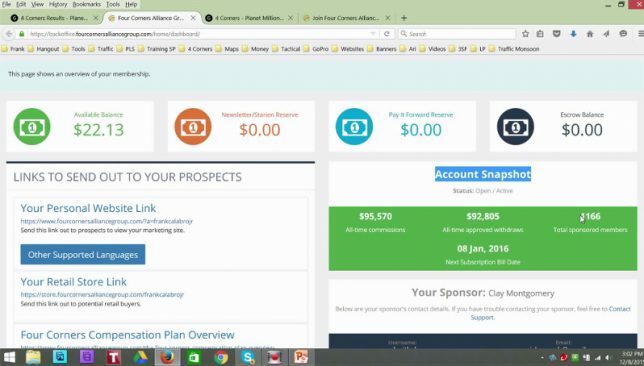 Wealthy Affiliate helped and changed me after I learned from the Online Entrepreneur Certification Course. Level 1 is free* and you should check it out. If you need any help, just let me know.